This thread contains comments for the article "Building a MQTT Gateway" posted on MySensors.org. I have built GatewayW5100MQTTClient according to mysensors. It works and relays my nodes. However, my old gateway with MqTT delivered the messages with my selected prefix and then node/child number + variable/sensor. MyMQTT/1/1/x/x/x where X is some number. It does not display S_TEMP. And what are the extra "numbers"? I do not know what publishes these..
For relevance, the sketches I upload are the ones in the new mysensors library, ex Atmospheric Pressure Sensor. The new MQTT gateway exposes the serial api to MQTT. It has less functionality. The old client gateway was a controller and translated the protocol to more readable messages and had a node-id handling. I had the same problem and switched to node-red with a serial gateway. I too use NODE RED, but just listening on MQTT and then putting the info into mysql databases. Thank you! I have used search, but it is difficult when you do not know what you are searching for And all information about 2.0 is overwhelming at the time being for me. Thanks, good feedback @Nicklas-Starkel . I just updated the main MQTT page, moving some of the instructions from the forum. Seems that the W5100 sketch of the MQTT gateway is missing #include <SPI.h>. I had to add it before #include <Ethernet.h>. As Ernst79 already mentioned: please add #include <SPI.h> as a switch to your code, thank you! Is it possible to have the MQTT client also act as a network gateway? Nope, sorry. You have to have to introduce a broker or controller acting as MQTT server. The old network gateway with mqtt seems to be removed and the client version is the one that id preferred. Is it possible to have both mqtt server and network gateway in that version? Sorry for my ignorance but I would like to know how to connect the gateway to the sensor. As I understand it, the radio communication is responsible for it, so can I put arduino + NRF24L01 + sensor at the other end? I thought that the gateway could be done only with the ESP8266 module. If you're using an ESP8266 and you find it "SOFT WDT resetting" whenever a node tries to send a message, try moving the wire from GPIO4 to GPIO5 - There are a few esp12E boards which have been incorrectly screen printed - worked for me with this board! Regarding ACK flag in MQTT. If a sensor sends data to the gateway, and it requests an ACK. It is the gateway that responds with an ACK, not the controller. How do one utilize the ACK flag in MQTT? Or rather, how do one get the ACK to display in a MQTT message? //We only expect one type of message from controller. But we better check anyway. Should I write a codesnippet like the above but one that sends a message back to the gateway, that the ACK was received? And also, if an ACK was not received that the sensor should try to send the message again. I have set up an MQTT gateway running on a Wemos D1, and a motion sensor running on an arduino nano. It seems to work successfully, but I had to define MY_NODE_ID in the sensor sketch because the negotiation for this is done by the controller. Presumably, I'm going to have to program my controller to respond to the mqtt message being sent to negiotiate the id, but I cannot find any documentation on the correct reply. Does someone have a link? Can this be used with RabbitMQ as broker? Hi, is it possible to configure the MQTT gateway to let me in to port 5003 via telnet and read the communication message (not MQTT payloads) there also? I know what is going on the MQTT server and I am subscribed to the topics the Mysensors gateway created and publish data to it. Does this look like its in a reset loop or would you say there is some other issue going on? If needed, my config is a Arduino Mega 2560 witha w5100 shield on top. I have specified the IP address of itself, the subnet, gateway, mqtt client IP (Controller), the mqtt topics, port, changed my LED pins. I have a node with a button next to me, when i press it the message is picked up by the gateway. Below is what happens in the serial monitor when i press the node button. I'm a little confused at what point to troubleshoot here because I seem to think that for some reason it keeps refreshing its connection to the MQTT server. Not too sure why it is pushing a message to the topic of "Gateway1-out/0/255/0/0/18" either. In case anyone needs to know where to downgrade: Tools -> Boards ->Boards Manager -> Select version for Arduini AVR Boards. @mfalkvidd - It is still seeming to repeatedly reconnect to the MQTT server. I've issued a ping command to the arduino from the mqtt server and its constantly pinging without an issue, even while the serial monitor shows that its reconnecting. I'de be interested to know if anyone else is running the MQTT client gateway with MySensors V2.1. I used to run it when it was first introduced into the development environment in 1.6 and its been fine for over a year, but i upgraded to V2.1 and now i get this. So, i don't actually know if it is supposed to keep reconnecting to the MQTT server. I have read somewhere here that it sends a wake/refresh packet/message to the mqtt server just to keep it alive, but they said that was every 15 seconds by default. This is happening every 5/6 seconds. i think you need to post your code just to make more complete info. I would like to know if anyone else's MQTT Gateway does this? If this is the normal procedure I can carry on with config work for the nodes. Its pretty weird, the serial monitor is showing this but the gateway seems to be functioning. Nodes are talking to it. I'm not sure on that output topic though, why would it be sending something to Gateway1-out/0/255/0/0/18? * The W5100 MQTT gateway sends radio network (or locally attached sensors) data to your MQTT broker. // MQTT broker ip address or url. Define one or the other. EDIT: My issue was resting on the MQTT Server, had OpenHAB and MySensors gateway using same ClientID. @Gabor-Bognar I also need to be able to do this. Is there a solution to have a port 1883 for MQTT and port 5003 for telnet? // Note that most of the Ardunio examples use "DEAD BEEF FEED" for the MAC address. In normal way, this line is note really important. Is it possible to have a single device acting as a ethernet gateway and an mqtt gateway? I am wondering why you cannot built the ethernet gateway and combine the mqtt client sketch into it? I am trying to shift towards mqtt (experiment) while still having sensors available in Vera. I have the MQTT plugin on vera but have not yet figured out how to use the child device to control devices via MQTT. It seems like a waste to control the MQTT device only through Vera and I would never be able to shift away from vera that way. I'm new to this so I am still trying to understand the entire picture. @scottdube my guess is that nobody with sufficient knowledge has had enough motivation and time to see if it can be done - especially since other solutions (nodered, myscontroller) already exist. maybe it is time to switch away from Vera to something else that still uses zwave? @scottdube you can let Vera connect to Nodered. I'd like to have a very simple (intra-home) web page in my raspberry PI that would be updated with all of my nodes information and that could also turn on/off nodes with actuators (basically I don't want to have a fancy controller). If I understood correctly, with this MQTT Ethernet Gateway I could implement this by running Mosquito that would subscribe information from each node, through this MQTT gateway. Does this mean I can avoid having a controller? I rebuilt my serial gateway to a MQTT gateway. FWIW I had to connect 5V to my WizNET (W5100) Ethernet module (3.3V did not work) I couldn't make DHCP work so I used a fixed IP. Finally I had to replace the capacitor over the radio power feed from 4.7 uF capacitor to a 100 uF capacitor (That made a big difference!). Works great now. Hi, is there any case for this gateway ? I wouldn't want all those wires to lay around in plain view..
@sionut "this gateway" is a bit ambiguous. The mqtt gateway can be based on different Arduinos and use different expansion boards, which will make a big difference for casing. Which variant are you planning to build? That's a good question. I didn't realize that the arduino board is not specified (neither in this tutorial nor in the ethernet one). However, I see that the ethernet gateway project (https://www.mysensors.org/build/ethernet_gateway) mentions that any arduino board would be fine. Since I'm only a beginner, I don't know what board would suffice for this kind of project. Could you recommend me the cheapest Arduino board that can do the job ? @sionut if you have wifi, I would suggest esp8266 (wemos d1 mini if you want a specific board recommendation). It has built-in wifi so you don’t need an expansion board. Guide: https://www.mysensors.org/build/esp8266_gateway It can be run in mqtt mode if you prefer mqtt over plain tcp. 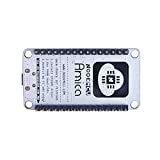 If you prefer ethernet, the Arduino Uno seems to be the one that matches the W5100 shield. Great. I have wifi, so I will use the esp8266. I think I will continue with this board here as it's something I can find in a local store nearby. Just connect the radio, install gateway software and you're good to go. Now, considering that the board already has WIFI, why do I need the radio ? @sionut the "normal" use of a MySensors network is to have multiple nodes using a cheap radio (nrf24) and a low-power microcontroller (Arduino Pro Mini is much more power efficient than the esp8266). The gateway connects the nodes (using nrf24) to your controller. Without a radio, the gateway can't talk to the nodes. See this page in the gatting started guide for a more complete explanation. However, if you don't need battery-powered nodes you could get a bunch of esp8266 and configure them all as gateways without adding radios to them. Is it feasible to have MySensors talking to an MQTT Broker like Mosquito (running on a rpi) via radio so using say a USB gateway AND also have WiFi modules talking to Mosquito and then having Mosquito talking to HomeAssistant? I see where this is doable via MySensors and radio links OR it can be done using WiFi modules but what if you want both? Yes that is possible. Mysensors connects through the gateway to MQTT and the WiFi modules to mosquitto directly. You can use the mysensors protocol also over the WiFi modules I believe. I'm not sure if it is possible with an usb gateway though, but for sure with a WiFi based gateway like ESP 32. Once you are on mqtt you can connect to and from all devices/controllers that support it. @gohan With a radio directly on the rPi would mosquito talk to both the radio and WiFi? I assume it would, I would think mosquito would just be a service that the radio or WiFi sends/receives data to but have not seen anyone talk about it. @electrik Sounds like what I want to do can be done, thanks. @alaskadiy no. The gateway (running as a service) would talk to the radio and to mosquitto. Mosquitto is unable to talk directly to the radio. Hi guys. I'm using an Arduino Uno+5100 based MQTT gateway. It works fine for it's gateway function but I'm not beeing able to send local sensor data. Is that possible? @guillermo-schimmel it should be possible to call present() and send() just like on a regular node. Could you share your sketch and the debug output? @mfalkvidd thanks. I just did that on a dedicated post. It's driving me crazy. @guillermo-schimmel ok, lets discuss there then so we don't split the effort and information in separate threads.